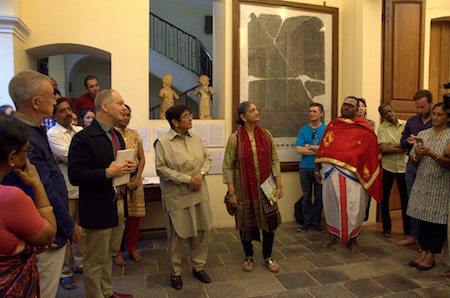 The honourable Dr. Kiran Bedi, Lieutenant Governor of Pondicherry, came to inaugurate the exhibition "Sacred Groves of Aiyaṉār" on the evening of January 31, 2019. This exhibition of photographs taken by Jean-Louis CARDIN, architect and amateur photographer, was organised for the first time in the library of the EFEO in Paris in 2018. Very generously, Jean-Louis CARDIN donated all the photographs he has taken since 2005 of sanctuaries of Aiyaṉār to the EFEO photographic archives in Paris.